For three months I’ve listened to a few friends brag about how good trout fishing is on Georgia’s Chattahoochee River. After flying 2,000 miles from Southern California, to The South, I was eager to tackle this urban Atlanta fishery. Fortunately, Mother Nature wasn’t as ready as I was. With the sun barely touching the surface of the water and our boat on the edge of the paved launch ramp, first sight of Atlanta’s greatest trout fishery reminded me of chocolate milk. Our local fishing buddies, Richard Weekley and Greg Payne, were choking on their thoughts. What was chalked up as a half-day, 50-fish outing drifting Gold Label salmon eggs drowned in mud and was being carried away by extremely high flows. Fortunately, I’ve been in this position dozens of times and didn’t drown in frustration. Neither did Weekley and Payne. We scanned maps looking for alternatives. Hoping not to waste more time we pinpointed famed Rock Creek, some 70 miles away in the Blue Ridge Mountains in North Georgia. Not knowing if it had been stocked there were no guarantees of success, nevertheless, charts showed the Hooch wasn’t dropping anytime soon. Enduring a windy, pine covered drive through the Ed Jenkins National Recreation Area, we arrived at the parking area for Chattahoochee National Fish Hatchery, only to find dozens of anglers sitting on their tailgates, seemingly waiting for something. 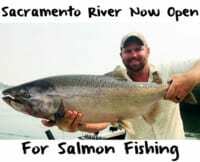 Payne and Weekley chuckled, grabbed the rods, a few jars of our Pautzke Gold Label Balls O Fire salmon eggs and began to walk the wooded banks. “You guys aren’t going to wait for them to stock?” I joking asked Weekley. Rock Creek is as close to Chattanooga (TN) and Greenville (SC) as Atlanta and two-hours from the University of Georgia in Athens, yet it was no secret to Georgia’s trout fishermen. The creek is literally spitting distance from rearing pens and gets hammered daily during trout season. It’s similar to the type of stream found in California’s western slope of the Sierra Nevada. 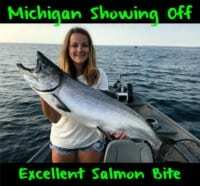 It had already been combed by dozens of anglers that morning, as our detour didn’t put us in the region until 10 a.m. There were five of us in the group, the other two, a Floridian in Brent Dyer and an LSU Tiger in Ash Hava, a guy who was used to speckled trout, not stocked rainbows. Dyer and Hava were going to be good barometers. Ironically, Dyer had brought a rod with line more suited for catfish. Neither had fished in clear, cold mountain streams. We instructed both to simply add a few Gold Label salmon eggs to the hook and cast into the pools and holes. With the number of guys sipping sodas in the parking lot I was cautiously optimistic. Fortunately, Dyer caught a rainbow on his first cast, and another on his third. Mr. Louisiana didn’t need much practice, either. He caught a six-fish limit, too. I couldn’t stop Weekley and Payne from catching trout. With roughly 50 anglers sitting in the parking area waiting for the stocking truck and another two dozen working their way up and down the stream struggling to scrape a rainbow or two out of the dozens of holes in the 100-yard section we fished, I didn’t make a single cast in the first two hours. The second I grabbed my rod someone in our group was hooked up – again. The guy who flew across the country filmed, took photos and was content watching these guys set hooks on almost every drift. “What did you catch that one on?” I’d ask. “Pautzke Gold Label,” they said. During a three-hour span in the Blue Ridge Wildlife Management Area we caught more than 35 stocked rainbows and one brook trout on Gold Label eggs, keeping enough for dinner while releasing the rest. Due to the success a crowd congregated in the area, some picking up a few of the loose Gold Label on the bank, and others bartering for our remaining jars. After bragging to me about their Gold Label success for several years Weekley and Payne were able to exhale that afternoon, smiling at passersby having caught fish in holes, runs, pocket water, riffles and deep pools. By the end of the day, Dyer was bragging, too. The saltwater angler from Florida (Dyer) casted. The red salmon egg with gold flakes drifted behind the rock. The rainbow trout ate it. 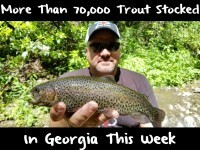 For the 35th time in shorter than a college football game we had proof that North Georgia trout are seeing gold; red salmon eggs with gold flakes, to be exact. Editor’s Note: Chris Shaffer is the Director of Operations at Pautzke Bait Company. He didn’t make a single cast at Rock Creek, but did pass out a few half-full jars of Gold Label to grateful anglers, who proceeded to catch limits, too. The Chattahoochee River trip has been rescheduled for late September.